It happened again…another senseless shooting…more helpless victims. Six people were killed and 13 injured in the bloodshed near the University of California, Santa Barbara. When tragedies like this occur, we all want answers. Why did this happen? What went wrong in the shooter’s life that laid the groundwork for this horrific result? Sometimes witnesses come forward and describe these types of shooters at loners. Sometimes people say they were bullied. Could being bullied cause someone to snap in such a violent way? 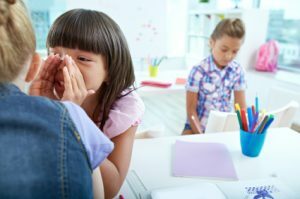 No one knows for sure, but it’s hard to deny that bullying is a big problem in the U.S. One in three students say they’ve been bullied at school, according to Stopbullying.com, the anti-bullying website created by the U.S. Department of Health and Human Services. It’s easy to get caught up in the statistics, but here’s one from DHHS that really stands out: 57-percent of the time bullying stops within 10 seconds when someone intervenes. Sending a simple message that bullying is NOT okay can stop the behavior in its tracks more than half the time. I’m not sure if my colleague Susan Kurlander knew this when she developed an anti-bullying program called Everyone Counts. Susan is a health educator for JCS. Inspired by a children’s book called One by Kathryn Otoshi, Susan designed Everyone Counts, an interactive program that encourages young children to talk about what it takes to feel strong enough to stand up for themselves and others. Susan has been taking JCS Prevention Education into local classrooms to help children as young as 5 years old, understand the power of this positive message. The program caught the attention of ABC2 News Anchor Jamie Costello. So he recently put together a story about Everyone Counts, and aired it on WMAR-TV. There’s no way of knowing what a program like Everyone Counts can prevent, but we can see by the reactions of the kids, that we’re planting a seed. And that’s a great place to start. For more information or to bring Everyone Counts to your local school, scout troop or gathering, contact Susan Kurlander at 410-843-7455 or skurlander@jcsbaltimore.org.